In Bullying Programs, A Call For Bystanders To Act A growing number of anti-bullying programs have emerged in recent years, and the focus of many has shifted from stopping bullies to encouraging bystanders to act. But in an industry where anyone can peddle virtually any kind of program, initiatives vary in their quality and effectiveness. 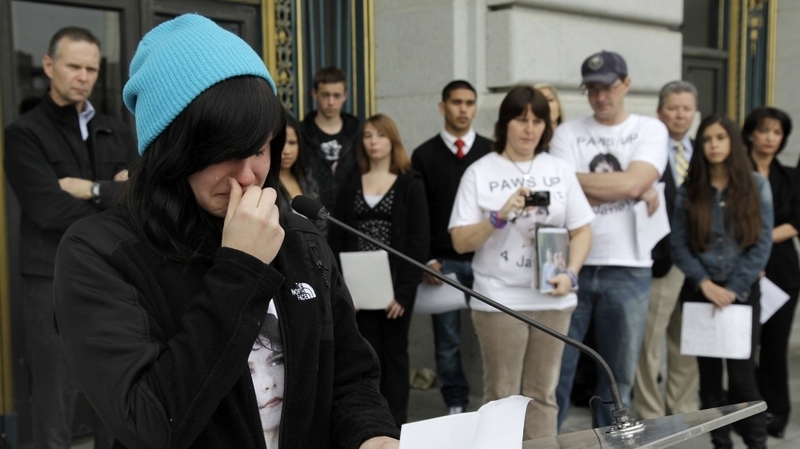 Alyssa Rodemeyer, 16, talks about her younger brother Jamey at an anti-bullying rally in San Francisco. Jamey committed suicide in September 2011 after being bullied. More schools are looking for ways to combat bullying among students. Many schools started by cracking down on bullies, then later focused on propping up victims, with the hope of helping to make them "bully-proof." Now, they have shifted their efforts to people who witness bullying. "A few years back, I used to be a bystander," panelist Lee Tu, a student from Allston, Mass., tells the audience during a recent anti-bullying conference sponsored by Harvard University. Tu says she saw a fellow student "called a whore ... and I didn't really do anything." But for most kids, it's a big leap to imagine they shoulder any blame for doing nothing when they see bullies in action. "If they're not the person shoving someone in a locker, or they're not online spreading rumors, they think they are not part of the problem," says Marc Skvirsky, vice president of the organization Facing History and Ourselves. Skvirsky helped create a study guide to accompany the Bully documentary. The guide focuses both on bystanders and what many anti-bullying campaigners call "upstanders": kids and adults who stand up to bullying when they see it. "We really want students to really reflect on their choices and the consequences of indifference," Skvirsky says. Erica Newell works with the Massachusetts Aggression Reduction Center, or MARC, which provides schools free or low-cost programs aimed at combating bullying. Today, she's teaching middle-schoolers in the town of Medway about the power of bystanders. Bullies are much like performers, she tells the crowd. Their audience, she says, are bystanders, "just sitting there watching, right? So they're not saying, 'fight, fight, fight,' — but they're also not doing anything." "So who are they helping?" she asks. "The bully, right?" Newell tells kids that she gets why they don't want to stand up to bullies. She understands they don't want to make themselves a target. But, she says, there are less risky options. "Don't join in. It's OK to turn around and walk away," she says. "You don't have to be BFFs or sit together at lunch all the time. Something as simple as that is showing the victim support." After the assembly, seventh-grader Carly Hundertmark says a friend once offered such a gesture to help her when she was bullied. "She would always call me over to a different table and find [a] way out of the situation," Carly says. "And she was actually the one who told my mom, 'cause I didn't feel comfortable about it." 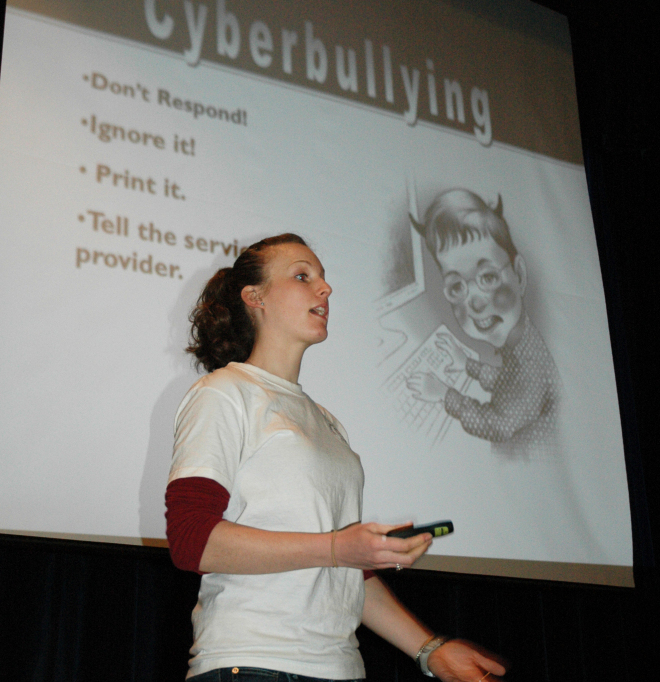 Erica Newell of the Massachusetts Aggression Reduction Center gives an anti-bullying presentation to middle-schoolers in Medway, Mass. Part of what made it hard to talk about was that the bully was one of Carly's friends. It was the same for Shannon McHugh. "In the movies, it's always a big tough guy who picks on the little nerd. But, it was my friend," Shannon says. "We would all joke around ... but then, she kind of took it to the next level and it started getting meaner," she says. "And she took it to the next level, and the next — and she just turned and bullied all of us." Westfield State University professor Elizabeth Stassinos says that's often the case. Kids often play both roles of bully and victim, and it's often hard to know who is engaging in aggressive or bullying behavior. That's why, she says, just cracking down on bullies is ineffective and why peer intervention is key. "It's very much like drunk driving," Stassinos says. "It's more effective when a student takes the keys away from another student." Making it cool to stand up to bullies may sound like a tall order, but it begins to seem a little less impossible when stars like Lady Gaga get into the game. At Harvard last month, when she announced her new Born This Way Foundation aimed at combating bullying, she told kids it's on them to change their school culture. "There is no law that can be passed," the pop star told the students. "I wish there was, because you know I'd be chained naked to a fence somewhere trying to pass it." Indeed, some people feel that laws can do more harm than good. New Jersey recently passed the nation's strictest anti-bullying law, leaving schools with an 18-page "compliance checklist." One school made headlines for investigating a second-grader who said another kid had cooties. Harvard education professor Rick Weissbourd says it's easy for adults to overreact. Whose Job Should It Be To Stop Bullies? "There's an allergy to kids experiencing any adversity," he says. "[But] we don't want adults intervening every time a kid teases another kid. We want kids to be able to learn how to develop coping strategies, and learn how to deal with conflict in constructive ways." The MARC program spends nearly as much time defining what bullying isn't as what it actually is, but not all programs do. In fact, some experts say it's a bit like the Wild West in the fast-growing industry of bully-prevention programs. Anyone can peddle anything — and they do. Massachusetts anti-bullying campaigner Joe Wojick, also known as "Joe the Biker," travels schools with his tough persona, rap songs and his motorcycle jacket to tell his story. "When I was your age, they called me 'yubbie,'" he tells a group of students. They may be compelling tales told with the best intentions, but Stassinos says schools should not be investing in programs that are not research-based. "It's often a feel-good experience, but it's a one-off event, and it doesn't change the climate," she says. "It seems just like a horrible waste of money to fund programs that aren't proven to work." Stassinos says the evidence is clear about what works: the slow and tedious task of changing kids' hearts and minds about what's cool — and what's not, and convincing them to speak out against aggressive behavior.